Whether it's a part day or a multiple day tour King Island Discovery Tours has a range of itineraries or we can tailor a tour to suit your specific interest in King Island. 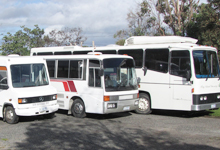 Our coaches and buses can cater for groups ranging from 11 or less and up to 49 people. We provide comprehensive information on King Island, its history, sites of interest and shipwrecks as a part of your tour. Your tour highlights could include Lighthouses at Cape Wickham and Currie, the Boathouse (restaurant with no food), the Calcified Forest, Penny's Lagoon (a suspended lake), pristine beaches, shipwrecks and the famous King Island Dairy for cheese tastings and purchases. Your tour, you choose. 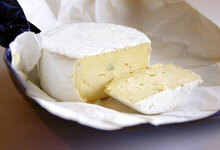 Our tours can include lunches as well as morning and afternoon teas. We can arrange pickups from the local airport or your accommodation and arrange transfers bwteen these as a part of your tour package. Not only is our fleet available for tours, we are also available for charters to transport groups to special events. History? Nature? Food? 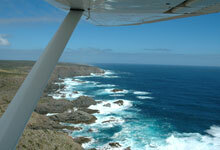 Let us help you with your King Island tour. Tailor a tour to suit your group. Special interest groups; part, full or multiple day King Island charters. Use your itinerary or ours. Bringing a tour group to King Island? We can organise an itinerary to suit.